In the previous chapter, the family of Jacob/Israel, the Egyptian families have all been sold to slavery so they can work for their food since the cereals that had been stored at the beginning of the fine are depleted. I don’t know if the had more grain reserves but this will be a matter of another day. This chapter starts with a dying Jake. Joseph comes to visit his father accompanied by his two sons, Ephraim and Manasseh [I will have to find out how many children he had]. This episode is quite interesting to say the least, when Joseph arrives, the old man has to be notified[I think he has lost vision] but a few verses later he sees Joseph’s sons! 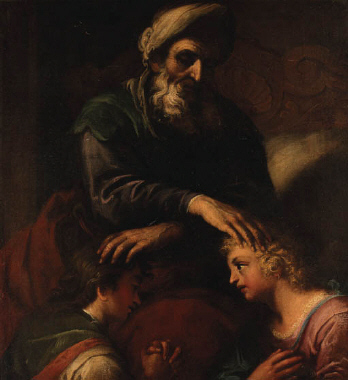 He then asks to bless the boys, so Joseph presents then, Manasseh to the right and Ephraim to the left, the eldest and the youngest consecutively, but he is displeased with his old man who crosses his hands such that his right hand is on Ephraim. I don’t understand this thing with right hands anyway! As it was with Cain and Abel, then Esau and Jacob, so it is here where there is preferential treatment; Jake tells Manasseh his younger brother shall be greater than he. Now apart from instilling hatred at such a young age, how did this senile old man know what would happen in future? The chapter ends with the old man telling Joseph of his imminent death and reminds him El will be faithful and get him and his family out of Egypt to a land parcel the old man had bought earlier. Just one last remark, I don’t remember blessing his other sons or grandchildren? Why just Joseph’s children?